Tiger Muay Thai and MMA training camp, Phuket, Thailand welcomes back multiple return guest, Eric Jensen, of XL Martial Arts, Australia. 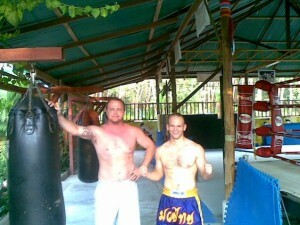 Eric, Martial Artist and gym owner, has been bringing students to Tiger Muay Thai and MMA for near five-years-now. Tiger Muay Thai and XL Martial Arts have some competitive visits coming in future as XL plans a trip over for eight of their Team fighters. Eric is also working with TMT weightlifting and diet instructor Peter the “Thai Hulk” on some kettlebell exercises for video. Welcome back, Eric and XL Martial Arts.